Urethane Flooring system installed in a food manufacturing plant. Urethane floors offer superior heat, chemical, & thermal shock resistance. For a consultation or estimate, contact us. Urethane floor systems feature unparalleled heat, chemical, & thermal shock resistance. Urethane Flooring Systems are suited for the most demanding and harshest environments. Urethane installations feature a thicker, cementitious, and chemical resistant base. It resists heavy impact. Plus it withstands the effects of food acids and powerful, industrial cleaning. 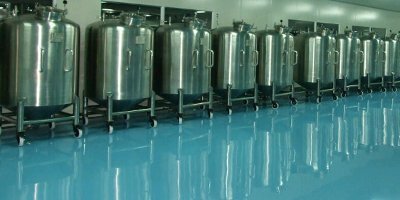 Our Urethane Systems are excellent for floor, food service and manufacturing facilities. Hybrid options are available, including Urethane top coats for epoxy flooring installs. For faster drying times, ask about our MMA Flooring Systems. We've applied Urethane, MMA and Epoxy floor coating systems for the following facilities and more. Contact us for the best combination and system for your Urethane Flooring Application. We're an Epoxy Company, specializing in Urethane Coatings & Systems. Make sure you meet and exceed your usage and industry's requirements. With informed and high standards, We can help you with that. We're a certified and qualified urethane contractor for all major brands, including Dur-A-Flex, BASF Chemicals, Key Resin Company and more. Get started with a competitive, professional bid. Contact us for a consultation and free estimate on your flooring project.